Highlights Of A Top Amana Heat Pump – Is It Right For You? The Amana ASZC16 heat pump system offers exceptional heating and cooling efficiency throughout the year. With its high energy efficiency, this system delivers comfort paired with lower operating costs. In this overview, our heating and cooling experts at Simply the Best, review this Amana model and discuss the features that interest you! The ASZC16 system has an excellent SEER (Seasonal Energy Efficiency Ratio) rating in addition to an impressive HSPF (Heating Seasonal Performance Factor) rating. SEER measures the system’s performance when it is functioning as an air conditioner, while HSPF measures its heating efficiency. The U.S. government requires new residential air conditioners to have a minimum SEER rating of 13, while the minimum rating to qualify for ENERGY STAR is 14.5 SEER. For heating systems, the baseline HSPF rating for new residential installations is 8.2. The Amana ASZC16 heat pump significantly exceeds all of these standards, with potential SEER performance of 16 and an HSPF rating of 9.7. Efficient systems like the Amana ASZC16 use less energy to heat and cool, which reduces your energy bills. Over time, thee high-performance systems will save you a significant amount of money compared to less efficient systems. The heart of this Amana heat pump is the Copeland Two-Stage Ultratech Scroll Compressor. The compressor was designed to have fewer moving parts than reciprocating compressors, which helps this piece of equipment to work more efficiently and to last longer. The heat pump coil is protected by a heavy-gauge, galvanized steel cabinet, with a post-paint baked enamel finish that helps to protect the equipment from normal weathering or extreme weather events. A liquid line filter drier helps to keep the refrigerant system free of moisture and dirt so that it lasts longer than units that do not feature filter driers. These premium details and a commitment to overall quality have allowed Amana heat pumps to distinguish themselves from the competition. Amana also backs its product quality with a lifetime limited warranty for unit replacement and a 10-year limited warranty on parts. *Don’t forget to register online within 60 days of the install to receive the warranty. Ask your installer how. Thanks to the ComfortAlert system in Amana units, your trusted HVAC technician may be able to monitor the performance of your heat pump remotely. This can allow your tech to detect performance deficiencies and potential problems as early as possible, so that these issues can be resolved before they develop into major problems that will cost a lot of time and money to fix. This proactive feature protects your system and helps to ensure that your heat pump has a long, productive life. Simply the Best Heating & Cooling is a trusted Amana HVAC dealer. Our licensed and knowledgeable techs will help you know what will work best for you and your home and can properly repair or replace these systems. Give us a call today to set up an appointment. Click here to learn more about our Amana services, financing and offers. 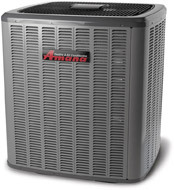 Save up to $1,000 on any Amana complete system!